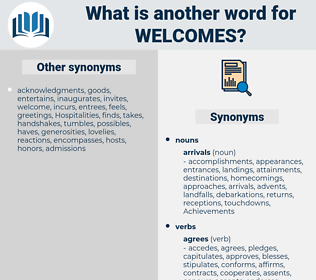 What is another word for welcomes? Congratulated, congratulates, celebrates, thank, received, supports, invite, invites, supported, receive, emphasizes, invited, receives, gratitude, encourages, endorse, approval, inviting, Appointments, approve, spokesman, endorses, emphasized, recognize, approves, marks, highlights, mark, urges, stresses, Awarded, approved, monday, underlines, revives, asks, rest, requests, revive, takes, gets. 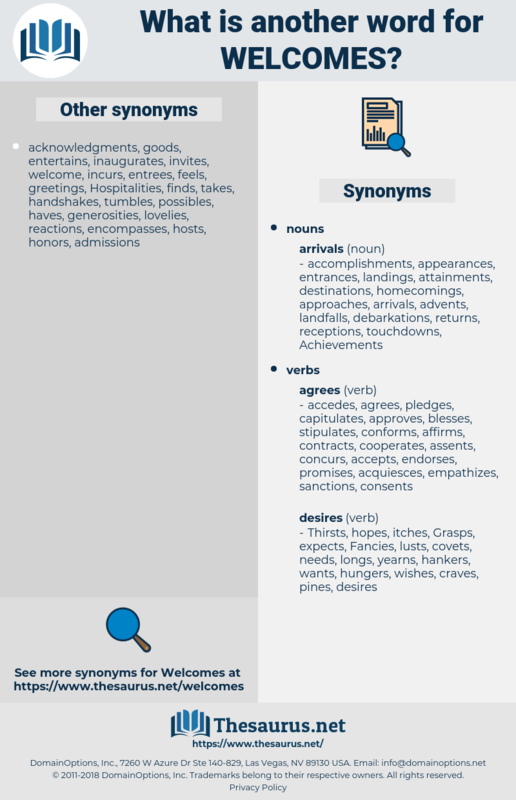 compliments, celebrations, accommodates, greets, notes, Considering, expresses, recognizes, relations, officials, fields, shelters, views, reaffirms, waves, customers, Houses, appeals, agrees, concurs, renews, issues, sanctions, reviews, adopts, Whereas, Efforts, conducts, calls, leases, sides, congratulates, margins, *, rents, members, renders, Countries, deeply, makes, supports, invites, salutes, encourages, appreciates, endorses, approves, urges, acknowledges, stresses, takes. commend, enjoys, benefits, Comes, works, values, provides, Has, With, commemorates, appreciate, embraces, likes, positive, compliments, acclaims, Loves, conducive, accepts, wishes, rejoices, open, opens, hopes, observations, feels, cherishes, concludes, complies, admire, expects, offers, subscribes, recommends, allows, matters, advocates, assumes, contends, considers, solicits, conveys, recognises, enrols, contains, convenes, deserves, bows, includes, boasts, attracts, reflects, presents, represents, covers, fosters, submits, evaluates, admits, helps, integrates, caters, remarks, Deems, promotes, proposes, upholds, passport, holds, understands, enhances, alleges, looks, observes, forces, respects, shares, regards, treats, honors, seeks, is, estimates, starts, leverages, brings, absorbs, believes, draws, claims, invokes, responds, Denies, handles, notes, insists, team, teams, serves, sees, deals, expresses, hears, defends, seizes, captures, assesses, Grants, fulfils, validates, wants, eu, argues, rent, asserts, maintains, approaches, recognizes, retains, favours, means, Gives, says, Backs, passes, stands, views, accounts, extends, keeps, Houses, agrees, concurs, thinks, Does, reviews, adopts, conducts, calls, leases, satisfies, rents, finds, celebrates, supports, invite, invites, receives, encourages, applauds, appreciates, endorses, approves, marks, urges, acknowledges, stresses, revives, asks, requests, takes, gets. congratulate, welcomed, appreciation, greet, salutes, applauds, welcoming. hospitality, satisfaction, happy, pleases, accommodates, greets, congratulate, congratulates, salutes. Aunt Nan and the others were ready at the camp with welcomes and words of genuine admiration. He said he would give it, and a thousand welcomes.